In the dream, I and a group of dream people went deep into the forest. There was a sense of “going down,” as at the start of a LowerWorld journey. We walked for some time and eventually found ourselves in a clearing towards the top of a small hill. Suddenly a buck with a large rack of antlers came running up the hill and became airborne, leaping in an arc many feet over my head 6 times! This felt amazing. Magical. At some point thereafter, we all trooped out of the forest, climbing a steep grade at the last as if returning to ordinary reality. The deer or stag shows up in many world cultural mythologies, and the number 6 has a variety of numerological attributes. But how all this came together in the dream and what the aggregate of it signifies weren’t immediately clear. Later that day, the first synchronicity. I googled the well-known California figurative painter Joan Brown to learn more about her and her work before attending an upcoming panel discussion at a local art center. While browsing dozens of paintings on the Joan Brown estate website, I encountered one that stunned me: “Adventures of a Woman #2,” dated 1975 — a painting of a woman reaching out to a (clearly!) magical deer at the eastern edge of San Francisco Bay. I printed out a copy, added a précis of my deer dream, and placed the printout on my altar. Eight days later, the second synchronicity. Another magical deer appeared. I was out of fiction from the library and browsed my shelves that evening for something to read before bedtime. I chose — or, no doubt more accurately, was guided to — Plant Spirit Medicine by Eliot Cowan, a book I’ve had for at least a decade and may never have read in its entirety. It had been years since I’d pulled it off the shelf. Early in the book, Cowan relates a conversation he had with Mexican shaman José Benítez Sánchez after dreaming multiple times about a powerful mountain peak, El Picacho. At the peak is a flat area with two trees, a little Huichol man (very old but can appear young), and a small dancing deer. The two trees represent the deer’s antlers, one the left, the other the right. Don José told Cowan the tree is the wind tree and the man is the magic of the wind tree (sometimes the antlers appear on the little man’s head). The wind tree teaches people how to heal! As if this weren’t enough, the third synchronicity, this time about the number 6. About 60 pages later in the book, the old shaman Don Guadalupe González Ríos begins telling a long story about making a sacred pilgrimage to the holy mountain where the wind tree lives. He speaks of going to the mountain every 6 years from the time he was a boy, at first with his father, then on his own. It turns out that, in this tradition, the period for maintaining one’s vows between pilgrimages is 6 years, and this series of 6-year cycles keeps repeating as long as the shaman remains committed to the path. Intuitively I know the dream buck’s 6 leaps over me link to my own shamanic commitment but it’s not clear exactly how. That said, I know it’s a mistake to get too literal minded, or analytical, when working with the dream or journey realm. Two days after my discoveries in Cowan’s book, I made direct contact with the Deer People. With all those synchronicities, how could I not? 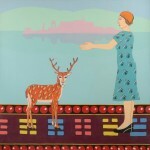 Sitting at my altar and gently rattling for only a few moments, a little dancing deer looking much like the one in Joan Brown’s painting greeted me and signaled me to follow. We quickly went down a short tunnel and then exited into the air — I jumped on Little Deer’s back and we flew to the Mesa to which I’ve journeyed many times before. Once we landed, Little Deer ushered me down the central “avenue” lined on each side with giant stones to the taller and even more massive stone at its end: the great Earth-being Mountain Spirit. Mountain Spirit enfolded me and that merging took me inside his depths — the depths of the mountain — where a set of instructive encounters and a vibrant, spirit-filled celebration took place. When the festivities concluded, Little Deer returned and flew me back to ordinary reality. For the next couple of weeks, Little Deer was ever present in my consciousness and twice we worked together explicitly. Once we returned to the Mesa for further teachings from Mountain Spirit. Another time we sat together at the outlet of the journey tunnel from which we flew to the Mesa and there Little Deer sent me healing through my third eye. In mid-October, on a hunch, I asked if Little Deer was meant to join the core interdimensional team I partner with in land whispering and was told yes! Little Deer had become a new ally, not only for me personally but for the much larger community. All this while I’d wondered if I’d see physical deer, which are common urban wildlife in the hills where I live. Inevitably, I did in late October. The fourth synchronicity. One morning walking to my car, I saw a 4-point buck and his doe mate across the street browsing at vegetation in my neighbor’s yard. There were a lot of tasty berries hanging low on one of the shrubby trees. I’ve seen these two individually and together a dozen or so times before so this was not a total surprise. I greeted the pair and thanked the Deer People for all their help and kindness. But I was surprised to find the deer still there when I returned a couple of hours later. The doe was lying down in the shade next to the garage door; the buck was a little farther uphill on the other side of the driveway and right next to the house. He was standing when I first saw him but then lay down. This was so sweet and delightful that I laughed. The pair seemed completely unconcerned about me and acted as if this were their home. And, in more than one dimension, it is.